Mary, the mother of God, has always had a special, quiet existence in my life. She is a constant, graceful reminder to me of meekness and gentleness and has marked my life from childhood to this day. I remember going to my grandmother’s house while my mother was ill and my father working. Being an Italian immigrant, she had several religious statues around the house, including a fully dressed infant of Prague who had it’s own wardrobe. Next to the prized infant was a stark painted statue of Mary as well as Saint Theresa. I remember having to sleep in my grandmother’s bed when I stayed over. She snored so loudly and I was up for most of the night imagining that her wheezing and snorting had a rhythmic beat. During those nights I would stare at Mary and she would stare back at me until I feel asleep. In school, we would prepare for the crowning of Mary with flowers each May. All of the names of the little girls in class would go into a hat to see who would be chosen to walk up the aisle and crown the church statue during our First Friday mass. There was even a song we would sing – “Oh Mary we crown thee with blossoms today…” that I still remember fondly. I never was chosen to crown Mary, but it was always my favorite mass. Mary was my icon of quiet strength and mansuetude as she held up her hands, looked up to heaven and stepped on the snake with such beauty and gentleness. As I grew older, Mary took on more profound meaning in my life. During one of my sleepless nights when caring for my dying father I remember seeing a water stain on the ceiling above his bed that had a shape like the silhouette of the Virgin Mary. I hadn’t noticed it before and it comforted me to think that she was watching over my father. As he progressed through the final stages of dying, he would speak to invisible people and one of them was named Mary. He could have been seeing his mother who was named Mary and had died when he was just a child. 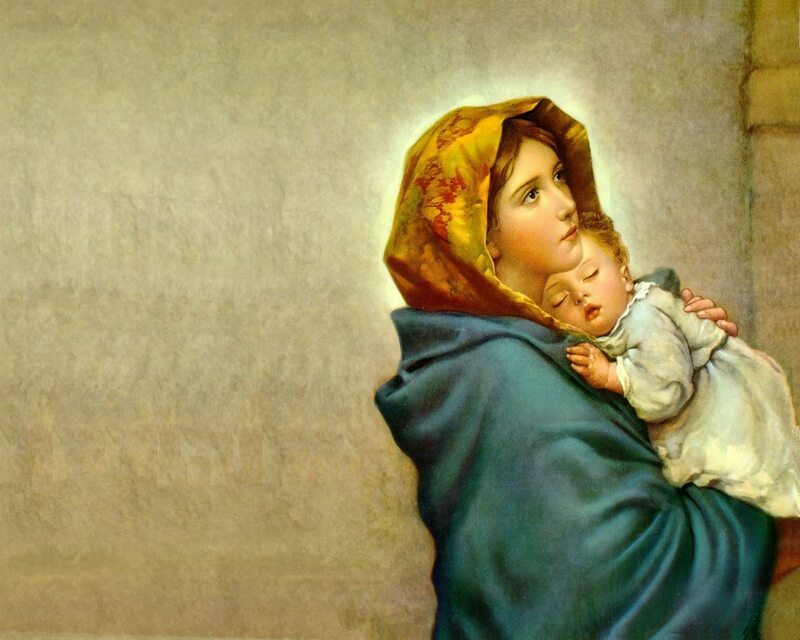 Nevertheless, in my memories it is was Mary who watched over and protected him; who held him in her arms as he died. It was her song – Ave Maria – that was played at his funeral that I cannot hear without crying and remembering the loss of my father. Mary is who I pray to when I am most scared and alone. When the plane is taking off or I am in fear of losing someone I love. She is the saint that I imagine quietly standing in my corner through out my life. She watches over me without pomp or circumstance, never asking for anything but my faith in return. As Mother’s Day approaches and I watch my son grow and thrive each day, I pray to become an example of gentleness and meekness in his life…the eyes he can stare into as he drifts to sleep, the arms that will hold him in times of pain and sorrow. Always silently, gently in his corner as his mother.